A recent discovery might have located a nearby solar system with up to five planets, one of them could be in just the right distance from its star to hold liquid water which is considered essential to life as we now them. Despite locating over 850 planets around distant stars since the mid 1990’s (when the first Extrasolar planet orbiting 51 Pegasi was discovered), the task of discovering small – Earth-like planets around distant stars is still extremely challenging. Unlike stars, planets do not emit light and when watched from a great distance it’s all but impossible to observe to observe directly using (today’s) even most powerful optical telescopes. 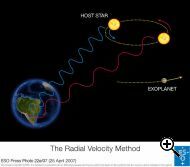 For that reason during the past two decades scientists created several techniques for locating planets using more indirect methods such as transit, Gravitational microlensing, Pulsar timing as well as radial velocity method which measures minute differences in the parent star’s movement as it moves towards and away from the direction of Earth. These differences can be caused by the existence of planets circling the star and after carful and lengthy measurements over a long period of time scientists can deduce with some level of certainty, whether a planet or planets indeed orbit a star using this indirect method. Mikko Tuomi and his team used the radial velocity method to analyze thousands of observations of Tau Ceti and deduced that at least 5 planets are currently orbiting the star. Tau Ceti is a bright G-type yellow main-sequence star like our sun and is one of the closest stars to earth (only 18 stellar systems are known to be closer). Although all five planets are believed to be closer to Tau Ceti than Mars does to our sun, since, Tau Ceti emits only about 50% as much light as the sun each planet receives less heat than those with similar orbits on our solar system. Tau Ceti’s 3 innermost planets are still too close and too hot for any chance of liquid water. The fifth one is probably too far away from the star, but the fourth planet – out four times as massive as Earth – might be just in the right distance to allow for liquid water and possibly life. And since Tau Ceti is about twice older than our sun if life did evolve on the planet it had much longer time to do so than on Earth. However, Mikko Tuomi and his group as well as other astronomers ask for some caution about the potential discovery as the results of radial velocity method could be interpreted differently and be caused by other reasons effecting the movement of Tau Ceti. More measurements will have to be taken over a long period of time to establish the existence of the 5 planets. If they will prove to exist maybe one day we will have more direct means of observing the fourth planet and gatherin more infomation about it. Mikko Tuomi’s research can be found on arxiv. TFOT has previously reported on many exoplanet related discoveries including a recent location of what appears to be a new class of exoplanets, composed almost entirely of water. We also covered the discovery of a planet forming region around an infant star done by the Spitzer Space Telescope, an MIT study showing that young planets stay hot longer than previously expected and a University of Michigan study which discovered that water vapor forms spontaneously in regions of solar systems capable of supporting life.